RIVERS & CO. is Charleston’s premier variety band. Whether it’s the cool sounds of JAZZ, the soulful sounds of BLUES and R&B, the Carolinas’ favorite BEACH MUSIC, or the up-tempo sounds of dance and party favorites, RIVERS & CO. has been pleasing audiences in Charleston for many years. One night you might find the band performing for a wedding reception in one of Charleston’s stately halls, and the next night performing for a local fraternity at Bowen’s Island Boathouse. 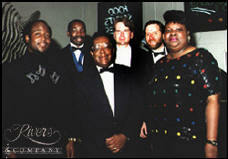 RIVERS & CO. was the house band at Kiawah Island Resort’s Topsider Lounge for over six years. RIVERS & CO. has also performed for Seabrook Island Resort, The College of Charleston, The Citadel, The Lord Proprietor’s Ball, Piccolo Spoleto’s Groovin’ On The Square, the Art Festival of Cali, Colombia, and countless weddings and company functions. RIVERS & Co. is OSCAR RIVERS on keyboards, JOY PRYOR and ROBERT HALL on vocals, CHUCK KING on bass, MAX MOORE on drums, and LEROY SMALLS on saxophone.